The latest rumor (unconfirmed, but the flyer looks like it’s from Disney) is that Hong Kong is getting it’s own exclusive Vinylmations. 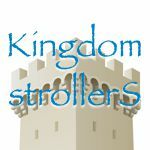 They will be part of the 5th Anniversary Celebration called, “Celebration in the Air”. The 9″ Castle Mickey is a Hong Kong exclusive. 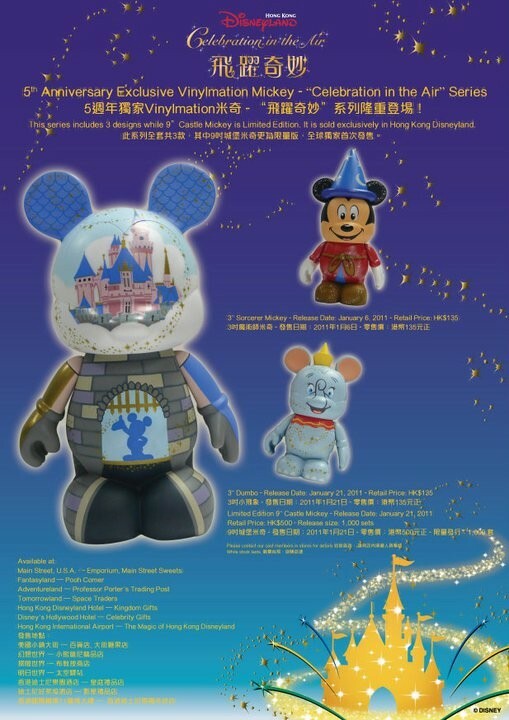 It will be a Limited Edition of 1000 and only available in the stores in Hong Kong Disney. The price will be HK$500 (~64 US$) and will be released on Jan. 21st. 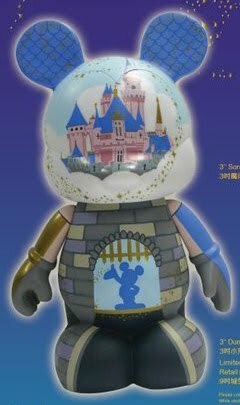 The Sorcerer Mickey is similar to the one that came with our Combo Park 5s, except he isn’t winking, but his face seems to be the only change. The flyer claims this is out yesterday (Jan. 6th International Date Line thing!) and will cost HK$135 (~17 US$). The most interesting, to me, is Dumbo! He comes with a cute little hat, and this is the first time we’ve seen Dumbo in Vinylmation form. Dumbo will also be released on Jan. 21st and will cost HK$135 (~16 US$). If anyone is over in Hong Kong, we’d love some of these! Here is the flyer we got the info from. Click to enlarge. I just got the Dumbo vinylmation! It’s really cute! It comes in a window box. It says “vinylmation” and then some Chinese characters.